South Africa - chased by an elephant ! 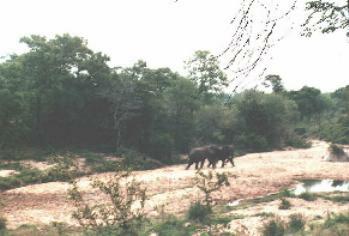 KRUGER PARK, OCTOBER 2000 - A travel to Africa is not complete without a safari tour. That's what they say... So I went on a safari tour. I had no big expectations to begin with. "We've seen it all on National Geographic Channel already", I thought. But the truth is : it really is exciting, it's not like on TV and it raises your adrenaline levels... sometimes. It's something not to miss. At first, it started rather disappointing. After a couple of hours driving in the Kruger park, after the 'thrill' of seeing your first zebra or impala in the wild, you start thinking 'where has all the wildlife gone, where are the elephants, the rhinos, the lions,... - did I travel this far to see some zebra and a couple of birds ? ' But then suddenly it happens, the show begins, ... suddenly an elephant or a rhino crosses the road, right in front of your car, ignoring all about you, just as if you're not there - you're not allowed to drive faster than 40 km/h in the park, so you're supposed not to bump into something. Seeing these big animals in their 'daily life activities', in their natural habitat, it's really impressive. Sometime later we 'bumped' into a family of elephants, feeding on the leaves of the trees. The whole family including the little ones. The sound of the elephants, the trees that crack as they pull against them. It's something unforgettable. Another 4WD passes by and tells us they have seen lions further down the road. Let's go ! Arriving there, what we saw was really impressive. 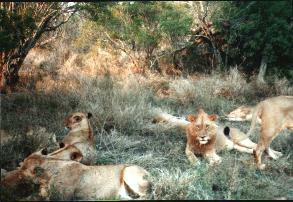 Eleven lions sleeping together, just besides the road. A real intimate athmosphere. We could touch them if we wanted to - but beware : these are real wild animals !Every year people get killed in Africa because they get out of their vehicles 'for the picture of a lifetime'. 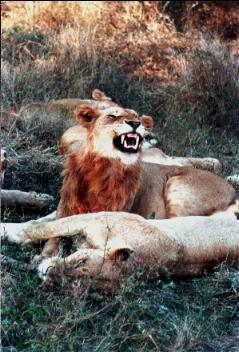 Soon after we arrived, some of the lions started to wake up, but none of them were aggressive to us; just like the rhinos and elephants we had encountered before, they just seemed to ignore us completely. So did the couple of elephants we met later on. We just came driving by, and from a distance, we could see an elephant next to the road. Big deal ... we had seen elephants before... we did not intend to stop to take pictures. Suddenly our guide stopped and put the vehicle in reverse. She had seen a snake on the road, and that was something to stop for ! The snake appeared to be hit by a car and as dead as a dead snake can be. So we moved on again, approaching the elephant again. The next moment, as we came next to this massive animal, it started to chase us ! Our driver didn't notice this at first, so we shouted : "Full throttle ! Elephant behind us". 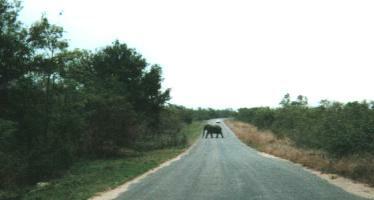 The elephant was accelerating fast and approaching our vehicle dangerously close. If he would hit the car, we would flip over ! Luckily enough our acceleration in first gear was good enough to escape from this aproaching danger and the elephant stopped following us - thank you Volkswagen. Who said safari was boring again ?